The Sam Sandos Christmas Program began in 1978 in the kitchen of Sam and Ethel Sandos, as a means to help out a few families who were down on their luck. Sam and Ethel provided a basket of food and a Christmas tree for the holidays. 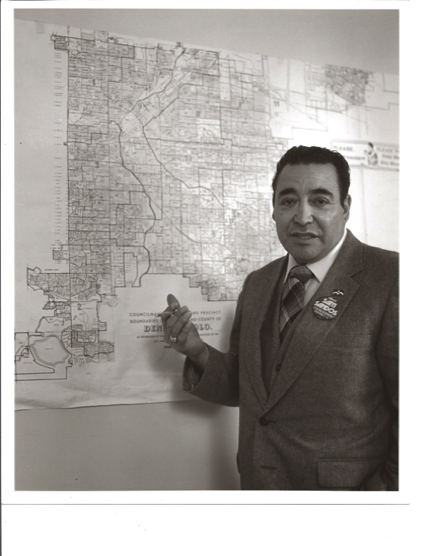 A few years later, Sam and his good friend, Joe Lucero, saw a need in the community for families who couldn’t afford a holiday meal. They worked with the St. Vincent de Paul Society of Presentation Church to provide food baskets to needy families. Thus began, “The District Three Christmas Basket Program.” Designed to “Serve those who would, otherwise, not be served.” The program has since grown and serves residents of Jefferson, Denver, Adams and Arapahoe counties.The program builds and delivers food baskets complete with a turkey and all of the trimmings for a holiday meal. This event occurs on the Saturday before Christmas. 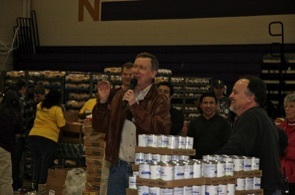 Governor John Hickenlooper speaks to our volunteers on the day of the event.